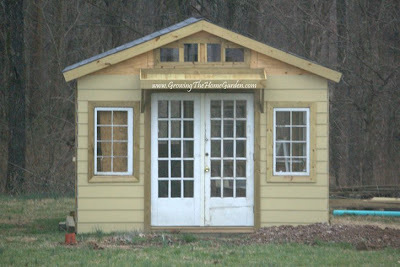 Before this weekend I made a big list on what I wanted to accomplish and one of those tasks was finishing the siding on the greenhouse shed. Unfortunately I didn't have enough time to complete it but I did manage to complete some large and tricky areas. When it comes to projects and time my ideas are always bigger than my watch. The trickiest parts were around the braces for the greenroof overhang. On one side of the brace was 5/16" while the other side was around 2". Cutting the areas around these spots was very time consuming. The cement fiber board was fragile around small cuts and I went through each spot twice before fixing usable pieces to the greenhouse. I may need to come back to add more trim to dress things up a little. The siding in the gable area still needs installed but I'm still debating on its design a little. I was thinking of hanging the siding diagonally along the roof line with the top of the current layer of siding becoming a clean edge for a small piece of trim. The siding definitely enhances the front of the building. The left side is almost complete and the right side has some small pieces that need fitted between the two large windows. The back is where the majority of my times needs spent. If the weather forecast holds true for the remainder of the week I may have another workday coming soon! Finish siding installation - figure out the gable design. Clean and repair all windows - they are a mess! The windows were found on Craigslist and had been sitting outside for some time. They are single paned and held in with caulk that is failing in many places. A few tubes of caulk will go a long way toward making this project look much better. Paint, paint, paint! When warm weather comes along to stay I'm looking forward to giving this project some color. Now I wonder what colors would work best for the siding and the trim? My big question on color is should it match the house or just blend nicely? This looks fantastic - great job! Can't wait to see it full of plants. It's really great to have that kind of garden house. Thanks a lot for the update. Very nice post. and interesting topic, regards for putting up. and wanted to say that I have really enjoyed surfing around your blog posts.